Download "MATH 101-07: College Algebra Fall 2013"
1 MATH : College Algebra Fall 2013 Course Meeting Location: Wickersham 101 Class Meetings: 5:00-5:50 MTR (CRN 4821) Course Instructor of Record: Dr. Cynthia Taylor Ph (Office): (717) Office: Wickersham 102 Office Hours: MTR: 4:00-5:00; TR 11:00-12:00; or by appointment. When my door is open, you are welcome! 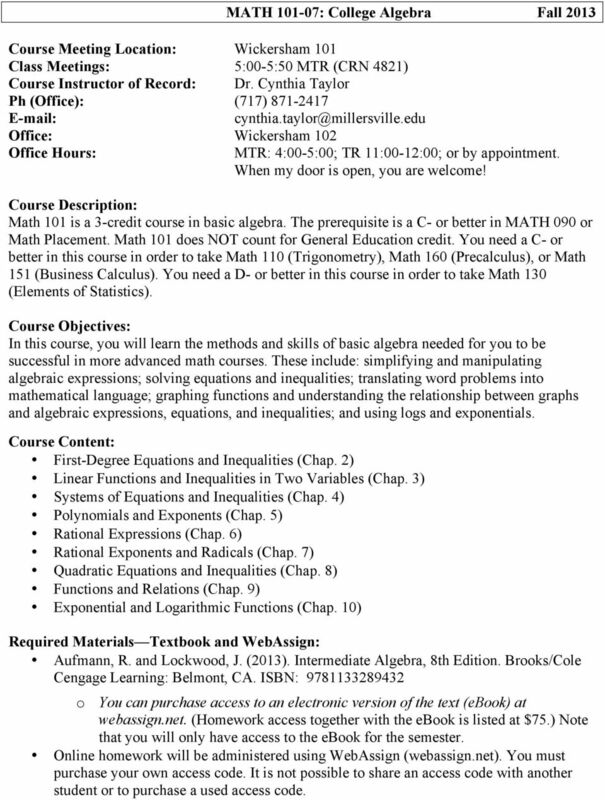 Course Description: Math 101 is a 3-credit course in basic algebra. The prerequisite is a C- or better in MATH 090 or Math Placement. Math 101 does NOT count for General Education credit. You need a C- or better in this course in order to take Math 110 (Trigonometry), Math 160 (Precalculus), or Math 151 (Business Calculus). You need a D- or better in this course in order to take Math 130 (Elements of Statistics). Course Objectives: In this course, you will learn the methods and skills of basic algebra needed for you to be successful in more advanced math courses. These include: simplifying and manipulating algebraic expressions; solving equations and inequalities; translating word problems into mathematical language; graphing functions and understanding the relationship between graphs and algebraic expressions, equations, and inequalities; and using logs and exponentials. Course Content: First-Degree Equations and Inequalities (Chap. 2) Linear Functions and Inequalities in Two Variables (Chap. 3) Systems of Equations and Inequalities (Chap. 4) Polynomials and Exponents (Chap. 5) Rational Expressions (Chap. 6) Rational Exponents and Radicals (Chap. 7) Quadratic Equations and Inequalities (Chap. 8) Functions and Relations (Chap. 9) Exponential and Logarithmic Functions (Chap. 10) Required Materials Textbook and WebAssign: Aufmann, R. and Lockwood, J. (2013). Intermediate Algebra, 8th Edition. Brooks/Cole Cengage Learning: Belmont, CA. ISBN: o You can purchase access to an electronic version of the text (ebook) at webassign.net. (Homework access together with the ebook is listed at $75.) Note that you will only have access to the ebook for the semester. 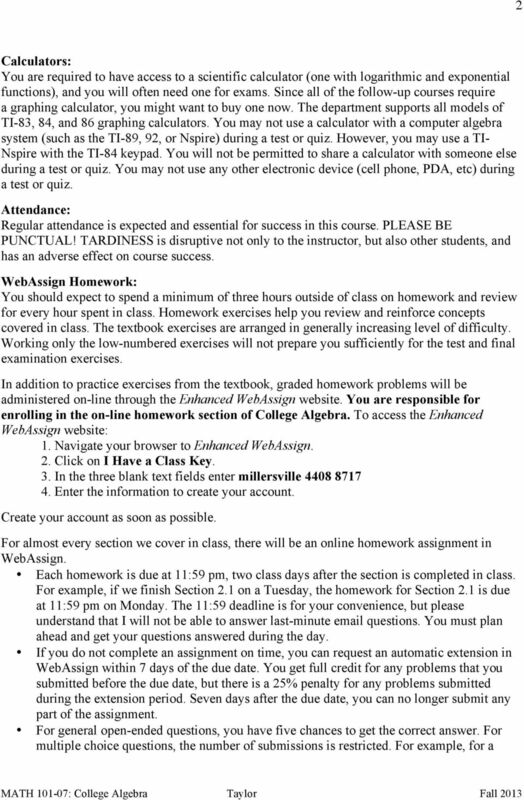 Online homework will be administered using WebAssign (webassign.net). You must purchase your own access code. It is not possible to share an access code with another student or to purchase a used access code. 3 3 Yes/No question, you only get one submission. Your two lowest homework scores will be dropped at the end of the semester. Course Assessment: Final grades will be calculated from your performance on online homework (15%), classwork (6%), three exams (54%), and a cumulative final exam (25%). 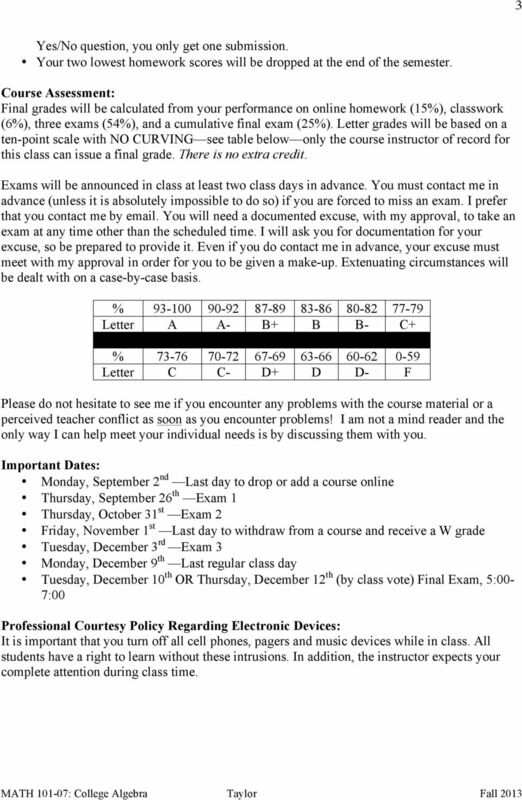 Letter grades will be based on a ten-point scale with NO CURVING see table below only the course instructor of record for this class can issue a final grade. There is no extra credit. 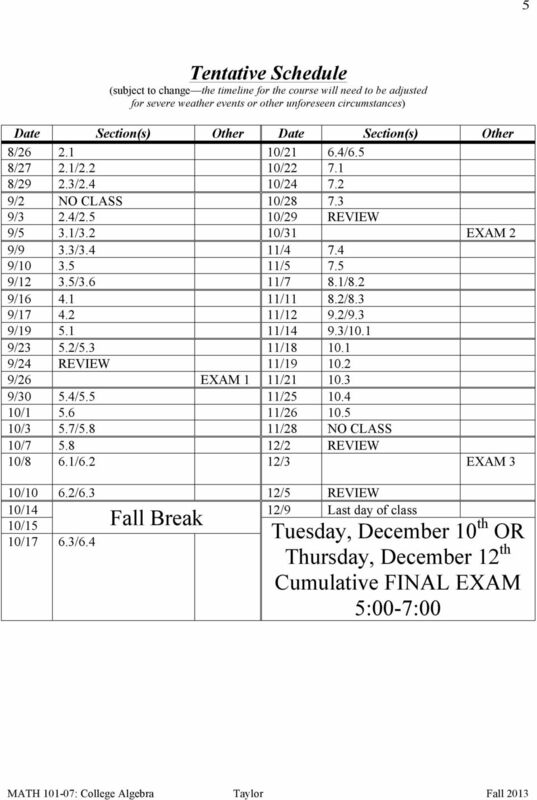 Exams will be announced in class at least two class days in advance. You must contact me in advance (unless it is absolutely impossible to do so) if you are forced to miss an exam. I prefer that you contact me by . You will need a documented excuse, with my approval, to take an exam at any time other than the scheduled time. I will ask you for documentation for your excuse, so be prepared to provide it. Even if you do contact me in advance, your excuse must meet with my approval in order for you to be given a make-up. Extenuating circumstances will be dealt with on a case-by-case basis. % Letter A A- B+ B B- C+ % Letter C C- D+ D D- F Please do not hesitate to see me if you encounter any problems with the course material or a perceived teacher conflict as soon as you encounter problems! I am not a mind reader and the only way I can help meet your individual needs is by discussing them with you. Important Dates: Monday, September 2 nd Last day to drop or add a course online Thursday, September 26 th Exam 1 Thursday, October 31 st Exam 2 Friday, November 1 st Last day to withdraw from a course and receive a W grade Tuesday, December 3 rd Exam 3 Monday, December 9 th Last regular class day Tuesday, December 10 th OR Thursday, December 12 th (by class vote) Final Exam, 5:00-7:00 Professional Courtesy Policy Regarding Electronic Devices: It is important that you turn off all cell phones, pagers and music devices while in class. All students have a right to learn without these intrusions. In addition, the instructor expects your complete attention during class time. 4 4 Academic Honesty Statement: Academic integrity is expected at all times. If you cheat on a quiz or exam, you will receive a zero for that quiz or exam. Furthermore, the university s policies on academic honesty and dishonesty will be strictly enforced in this course (e.g., policies related to cheating, academic misconduct, etc.). Review these policies in your student handbook and in the Academic Honesty and Dishonesty brochure. Accessibility Statement: If you need accommodations because of a documented disability, if you have emergency medical information to share with me, or if you need special arrangements in case the building must be evacuated, please inform me immediately. Please see me privately after class, or at my office. 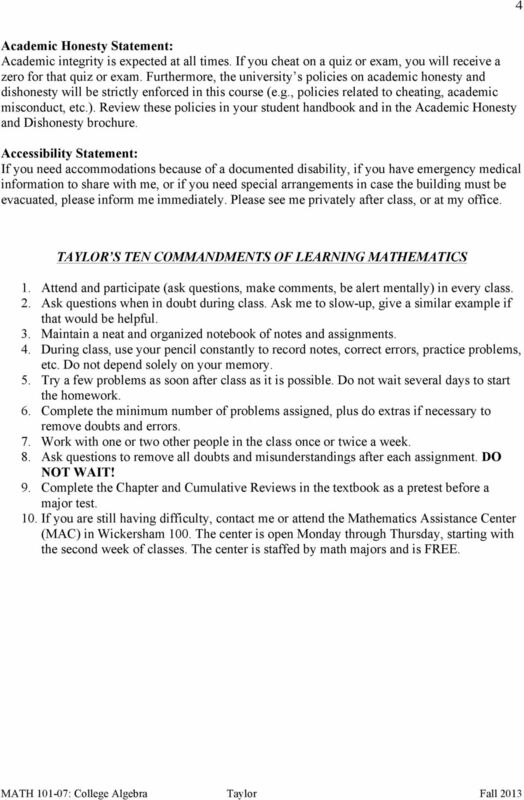 TAYLOR S TEN COMMANDMENTS OF LEARNING MATHEMATICS 1. Attend and participate (ask questions, make comments, be alert mentally) in every class. 2. Ask questions when in doubt during class. Ask me to slow-up, give a similar example if that would be helpful. 3. Maintain a neat and organized notebook of notes and assignments. 4. During class, use your pencil constantly to record notes, correct errors, practice problems, etc. Do not depend solely on your memory. 5. Try a few problems as soon after class as it is possible. Do not wait several days to start the homework. 6. Complete the minimum number of problems assigned, plus do extras if necessary to remove doubts and errors. 7. Work with one or two other people in the class once or twice a week. 8. Ask questions to remove all doubts and misunderstandings after each assignment. DO NOT WAIT! 9. Complete the Chapter and Cumulative Reviews in the textbook as a pretest before a major test. 10. If you are still having difficulty, contact me or attend the Mathematics Assistance Center (MAC) in Wickersham 100. The center is open Monday through Thursday, starting with the second week of classes. The center is staffed by math majors and is FREE.